VM’s (Virtual Machines) are seen to be the most common way of consuming the infrastructure as a service. There are a few VM’s which are born on the cloud, this means that from day one they were designed to be operated in a cloud environment. Although there is a huge base of VM’s which are running in enterprise datacentres, which over time their customers might want to move to the public cloud. Although virtualisation is one step to make it easier in terms of abstracting away software from the hardware, even though in reality it can be more difficult. 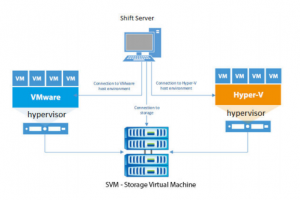 Virtual machines might need to firstly be converted into the correct format if the cloud is running a hypervisor which is different to the one that the VM will be currently running on. Even though there is an industry standard format for example Open Virtualise Format (OVF) which defines, on immediate and portable VM format, it will not address the actual runtime differentiates among the various hypervisors. The need for conversions till remains and it appears to be more complicated than just converting from on VM disc format to another VM disc format. Each hypervisor will present different virtual hardware which means many drivers may need to be injected for the optimal performance. Some virtual machines may contain environment-specific agents or even software for example special guest tools, management/security agents and many others. Many older versions will need to be uninstalled and then the relevant replacements which can be installed during conversion. The converter software has varying capabilities; in the way it handles these issues. For some cases, customers might need to rely on an additional configuration management software or even custom scripting to complete the conversion. It is no surprise when the VM conversion is at the top for concern, for companies who are looking to migrate VM’s top the public cloud. For many customers they need the ability to move their VM’s back and forth between their public clouds environment and their on-premises. Although unfortunately, when the customers on-premises and cloud hypervisors are different, then the conversions may be each time the border is crossed. For the process of moving and integrating VM’s across both the customer’s on-site premises and cloud environments which needs to be seamless so that work flows can be completely automated. Even though this is a challenge, it is necessary in order to prevent any conversions issues from slowing down any IT processes and can hinder the cloud usage. The other top challenges that come with VM migration revolve around bandwidth, which is the scarcest and the most expensive resource in the cloud today. A study showed that transferring VM’s along with the related dataset was rather big and the data could even be in the terabytes. Even transferring the data across the public internet can also be seen as unpredictable and can also be dependent on the WAN connections and the clouds provider’s capabilities. For more information, speak to one of our sales advisers today. Ten reasons why you will love the Windows Server 2016 The leading four-socket server isn’t Dell or HPE. Surprise!